Golden Age canals lined by tilting gabled buildings are the backdrop for Amsterdam's treasure-packed museums, vintage-filled shops and hyper-creative design, drinking and dining scenes. Amsterdam's canal-woven core is laced by atmospheric narrow lanes. You never know what you'll find: a tiny hidden garden; a boutique selling witty, stylised Dutch-designed homewares and fashion; a jewel-box-like jenever (Dutch gin) distillery; a flower stall filled with tulips in a rainbow of hues; an old monastery-turned-classical-music-venue; an ultra-niche restaurant such as an avocado or strawberry specialist or one reinventing age-old Dutch classics. Fringing the centre, post-industrial buildings in up-and-coming neighbourhoods now house creative enterprises, from art galleries to craft breweries and cutting-edge tech start-ups, as well as some of Europe's hottest clubs. You can't walk a kilometre without bumping into a masterpiece in the city. The Van Gogh Museum hangs the world's largest collection by tortured native son Vincent. A few blocks away, Vermeers, Rembrandts and other Golden Age treasures fill the glorious Rijksmuseum. The Museum het Rembrandthuis offers more of Rembrandt via his etching-packed studio, while the Stedelijk Museum counts Matisses and Mondrians among its modern stock. And for blockbuster displays, the Hermitage Amsterdam delivers: the outpost of Russia's State Hermitage Museum sifts through its three-million-piece home trove to mount mega exhibitions. Two-wheeling is a way of life here. It's how Amsterdammers commute to work, go to the shop, and meet a date for dinner. Abundant bike-rental shops make it easy to gear up and take a spin. If locals aren't on a bike, they may well be on the water. With its canals and massive harbour, this city reclaimed from the sea offers countless opportunities to drift. Hop aboard a canal boat (preferably an open-air one) or one of the free ferries behind Centraal Station, or rent your own for a wind-in-your-hair ride. 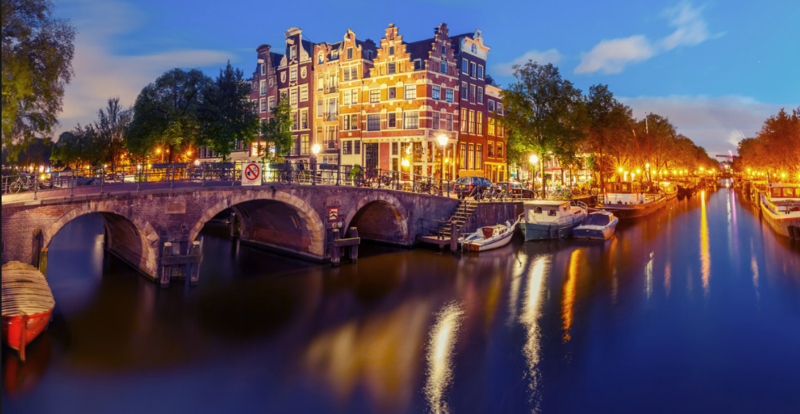 Amsterdam is famously gezellig, a Dutch quality that translates roughly as 'convivial' or 'cosy'. It's more easily experienced than defined. There's a sense of time stopping, an intimacy of the here-and-now that leaves your troubles behind, at least until tomorrow. The easiest place to encounter this feeling is a bruin café (brown cafe; traditional drinking establishment). Named for their wood panelling and walls once stained by smoke, brown cafes have gezelligheid (cosiness) on tap, along with good beer. You can also feel gezellig lingering after dinner in snug restaurants while the candles burn low. In the Netherlands (Holland) the power plugs and sockets are of type C and F. The standard voltage is 230 V and the standard frequency is 50 Hz. Which power plugs and sockets in the Netherlands (Holland)? In the Netherlands (Holland) the power plugs and sockets are of type C and F. Check out the following pictures. Type C: also known as the standard "Euro" plug. This socket also works with plug E and plug F.
Type F: also known as "Schuko". This socket also works with plug C and plug E.